Ziaeddin Torabi is one of Iran's most well known poets and is the winner of the 2010 Iran Annual Book Prize, the nation’s top honor for writing, for his poetry collection Face to Face with Dreams. He has published more than thirty volumes in different areas including many volumes of poetry, translation, criticism, and review. Born in 1944 in Zanjan, Iran, Torabi went on to earn a BA in English Language and Literature from Isfahan University and an MA in Linguistics from Tehran University. 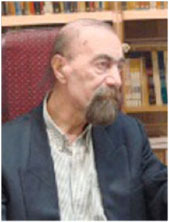 He was the head of the Tehran Municipal Literary Center and taught literature at the Tehran University of Science and Technology for a decade.